How many decibels is a quiet generator? How loud are 60 decibels? How many appliances can you plug into a 3000-watt generator? Are you looking for a small quiet generator for personal use? Chances are you have already scrolled down pages to pages to find information. I’m glad you have finally made it here. In this article, I will show you the quietest 3000-watt generators for home use and RV camping. I will walk you through the most fundamental yet essential elements of a great generator. I also do some compare and contrast so you will have a better glimpse of what the market has to offer. The robust engine is EPA, CSA, CARB certified. 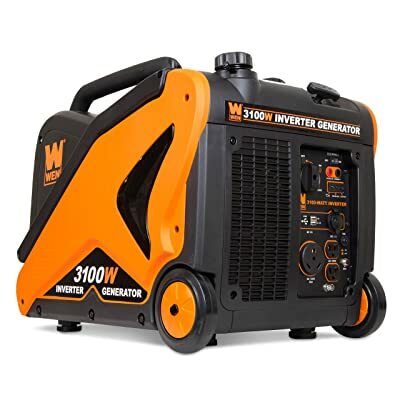 If you think a dependable source of power doesn’t come cheap, the WGen3600 will change your mind. The reasonable price is what this product has to offer. Other than that, it features many useful features. This product utilizes a 212 cc Westinghouse OHV Engine with cutting-edge technology that guarantees continuous power. It generates a peak power of 4650 Watts and a running capacity of 3600 Watts. This means the WGen3600 is compatible with standard appliances such as lights or fridge. Even when the electrical grid shuts off, you can still enjoy using any domestic devices. The Westinghouse WGen3600 is well-built. It features a steel frame over the unit to protect the interior components such as the gas tank. The running motor generates around 69 dBA of noise at a distance of 23 feet, as loud as a working vacuum cleaner. People who are sensitive to noise will not like it very much. Compared to other conventional generators, it is fairly quiet, so you don’t have to worry if your neighbors ever complain about the noise. This unit offers a 4-gallon tank that can run up to 12 hours with 50% of load capacity. Of course, if you want to increase the load capacity, the running time will decrease. Though the WGen3600 isn’t a lightweight product for easy transportation, it does include a wheel kit to increase the portability. This product is one of the rare generators passed the Californian Air Regulatory Board (CARD) and the United States Environmental Protection Agency (EPA). 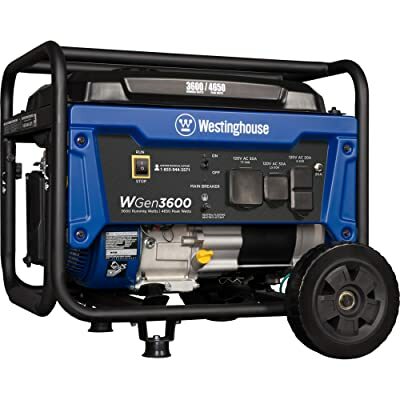 The Westinghouse WGen3600 is an excellent choice when it comes to different outdoor activities that require electricity. Plus, in time of disaster, this product will undoubtedly guarantee safe heaven. Those who want to utilize all of these useful features with an affordable price should give this item a try. Noise Level 68 dBA from 23 ft. The Champion 3500-Watt RV Ready is a solid-built unit that bestows a myriad of benefits. The robust 196cc 4-stroke Champion engine allows this machine to generate 4000 starting watts and maintain 3500 running watts. It provides adequate energy for most of your household appliances such as lights, fridge, fan and so on. Furthermore, this product includes volt guard technology, meaning your equipment will be protected from overloads and voltage spikes. The tank size of 3.8 gallons allows the generator to operate up to 12 hours at 50% load capacity. This is a well-designed product with a rugged steel frame to provide extra protection. At a distance of 23 feet, the Champion 3500-Watt RV Ready generates a noise level of 68 dBA. One cool thing about the Champion 3500-Watt RV Ready is that it features cold start technology. This enables the engine to function in extreme weather. You don’t have to worry being stuck in the cold without electricity anymore. If you live in California or any states that have strict environmental regulations, you can still use this product. It is EPA certified and meets the CARB standard. The generator comes with an oil funnel and sparks plug tool. It is also portable with a set of wheel kit. In case you are looking for a durable generator that can operate under extreme weather and sustain outdoor activities, the Champion 3500-Watt RV Ready is indeed a good choice. 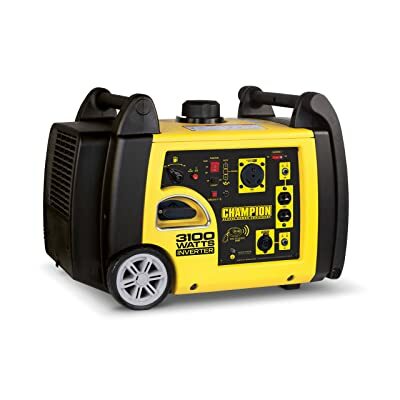 The Champion 76533 3800 Watt Portable Generator is a combination of versatility and suitability. This produce adopts a 224cc 4-stroke hybrid Champion engine. The hybrid motor can function both on gas and LPG (propane). If you are a pro-eco user, using clean energy must be your top priority. The robust engine offers a peak power of 4750 watts and maintains its performance at 3800 watts. As for propane users, the peak power is around 4275W, and running power is roughly 3420W. 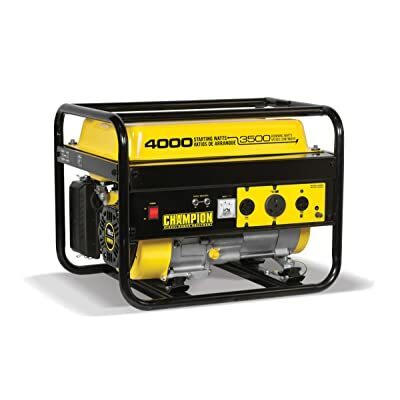 The generator can meet the demands of most household devices in case of emergency. It can also support most water pumps and tools. The Champion 76533 is especially great for RV usage and other outdoor activities. This product certainly works with sensitive electronic devices such as your phones or speakers. The electrical recoil allows you to start the generator in cold weather, eliminating the fear of living in the cold without electricity. The tank size of 3.4 gallons enables the machine to continuously run for up to 9 hours at 50% load capacity. It can also operate up to 10 hours with a 20-lbs propane container. This rugged generator is compatible with most electrical appliances. The pre-installed volt guard provides additional protection from voltage surges. Plus, the Champion 76533 features a digital screen for you to keep track of its voltage, remaining hours and so on. This item generates 68 dBA of noise level at the distance of 23 feet. Perhaps it is not the quietest generators out there in the market, but it does offer excellent quality at a reasonable price. If you are looking for an environmental-friendly, highly operational and budget-friendly generator for RV usage as well as household electrical needs during emergencies, the Champion 76533 surely makes an excellent choice. Welcome to the world of portable, stable and convenient inverter generators. The first product I would like to introduce is the WEN 56310 generator. The 56310 model utilizes the powerful 212 CC 4-stroke OHV engine. It starts off at the peak of 3100W and maintains its performance at the rate of 2800W. It is designed to maximize the stability and lower any distortion to only 1.2% at full load capacity. This product is not only compatible with household appliances but also sensitive devices such as smartphones or laptop. What I like about this product is it offers an Eco-mode. This allows the generator to regulate its speed accordingly to match with the current load and reduce the gasoline consumption. The Eco-mode also helps keep the engine in a good state and operate quietly. As you can see, this portable machine weighs only 82 lbs. It is the lightest model in the whole list. What’s more, the WEN 56310i features a set of wheel kit and a collapsible handle to maximize transportability. Plus, this generator creates only 57 dBA of noise, which is equivalent to a normal conversation. It is also the quietest functioning generator in the list as well. What great about inverter generators is you can connect two models to create double power. The generator is parallelly designed to make this process easier. It features low-oil shut down mode to ensure no appliances are damaged after used. What don’t I like about this model? It uses a fragile plastic housing. And the eco-mode is only usable when the full load is under 1000 watts. So, are you looking for the reliable power sources for recreational activities, RV usage or even household electrical needs? The WEN 56310i generator will undoubtedly be a good catch for you. Noise Level 58 dBA from 23 ft.
Champion 75537i is another RV-ready portable generator I want to mention. Its powerful 171cc single-cylinder Champion engine starts off at 3100W and maintains at 2800W. This is a safe rate for most household appliances and vulnerable electrical devices. If you are always on the move, this generator, offering 120V 30A RV outlet, will undoubtedly be a great companion. Besides the manual start, it features wireless control that allows you to kick off the machine from a distance of 80-feet away. As for the transportability, this model provides a set of wheels with two handles to maximize the ease of transporting. The Champion 75537i offers a tank size of 1.6 gallons. It can function up to 4 hours at 50% load capacity. At 25% load, the running hour is up to 8. You don’t have to worry much about the safety since this product features both low-oil shut-off and overload alert. One significant advantage of inverter generators is that they can function at a quiet volume. The Champion 75537i makes no difference. It generates only 58 dBA from 23 feet. Even my neighbor, who hate noises, agrees that this generator doesn’t disturb him at all. This model is also EPA and CARB certified. The Champion 75537i receives quite a few complaints about their remote control. Some said their remote controls stop working after several uses. Though I think it is not a design error, the malfunctioned remote control is indeed a big drawback. Nevertheless, I believe that the Champion 75537i is an excellent piece given its functionality, versatility, and transportability. RV travelers, household users who look for a reliable and quiet generator, you should give this one a try. Briggs and Stratton have earned their prestige through reliable and qualified products. Their P3000 PowerSmart is an inverter model that guarantees the best performance when it comes to providing electricity. This product weighs around 84 lbs, which I consider lightweight. It features a set of wheels so that you can move it around. This generator doesn’t take up space thanks to the compact design. My only concern about the exterior is the plastic cover. It doesn’t look very durable. 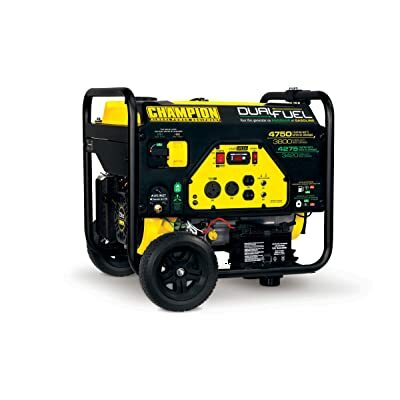 The fuel tank of 1.5 gallons helps the generator maintain its performance up to 10 hours at 25% load capacity. As the capacity increases, the running hour decreases. At 50%, it can only run for 5 hours. The small tank size is a slight shortcoming for most inverter generators, especially when they often come at a high price. As for the noise level, like its inverter counterparts, this model functions quietly at a level of 58 dbA. The model also reduces the speed of the motor, allowing it to generate less noise. Other highlights are the LCD and easy-to-operate control panel. The product also features a power-smart mode that allows the engine to change its speed according to the overall load capacity, thus reducing noise and maximizing efficiency. Unfortunately, this product can’t be used in California since it fails to meet the CARB requirements. 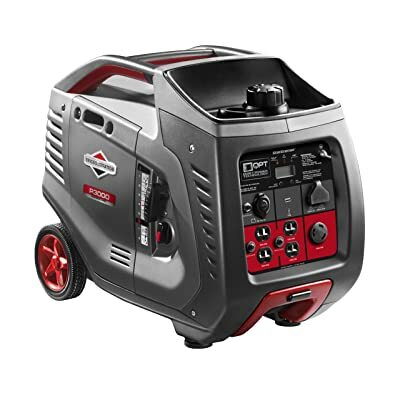 The Briggs & Stratton 30545 is an excellent generator regarding portability and functionality. If you are looking for a compact and versatile generator for household demands or RV usage, this should be your top choice. It isn’t easy for me to answer this question. Though you can find the noise level rating (decibel) in each generator; however, different people have different ideas about noises. What seems fine to me could be to too loud for my neighbor and so on irrespective of the manufacturer measurement. Generally, decibels indicates the noise one generator makes at a certain distance. Most of the time, when you see a model with 70 dBA of the noise level. It means this product emits the same sound like a vacuum cleaner at a distance of 23 feet. No one should keep generators close to their tents or houses since they release toxic emissions. Personally speaking, I would recommend generators with a noise level below 70 dbA. To me, a quiet generator will create around 60 decibels and not exceed 70 dBA. If noise is a big problem for you, I suggest you choose inverter generators since they are the quietest generators in the market. As I mention before, people take this measurement subjectively, so you should check it carefully before shopping for one. Most generators you see in the list above is roughly 60 decibels. So how loud are 60 decibels? 60 dBA is considered reasonably quiet. It is equivalent to regular conversations in public places such as restaurants or office. Most people find 60 dBA acceptable. Generators with 60 decibels are considered quiet. The number of appliances you can plug into a 3000W generator depends on two factors: their power demands and duty cycle. Each appliance has different power demand. For example, a coffee maker requires minimum 600W and maximum 1750W to function. For a dishwasher, the rating varies from 700 to 1800W. A light bulb will work correctly from 60W to 120W. Last but not least, refrigerator only needs 132 to 192W to operate. So, if you want everything to work at the same time or full duty cycle, the total amount of power demands of appliances should not exceed 3000 watts. Other than that, your electronic devices will have to work at lower voltages. That could eventually cause damage and malfunction. In case the duty cycle is only 50% or 25%, you can hook up quite a lot of appliances. Since not every device function simultaneously, you can connect up to probably 10,000 watts of the total power demands. 3000 Watt generators are “entry-level” products, suitable for household and outdoor activities. Depending on your preferences and demands, you can choose the most suitable one by reading my review carefully on the quietest 3000-watt generators for home use and RV camping. I hope that this article has equipped you with not only information on both conventional and inverter generators but also general specifications so that you can make a conscious decision when shopping for your desired product.